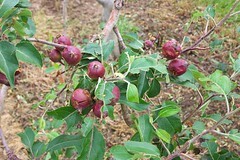 Hail can injure apple fruit, shoots, and limbs. The extent of the injury usually depends on the size and shape of the hail and the duration of the event. Injury can range from torn or shredded leaves and small dents that don’t break the fruit skin to effects so severe that an entire crop is lost due to physical damage. In some cases, replacement of trees is necessary, especially when young trees have significant bark injury. Fungicide protection of injured tissues may be necessary immediately after a hailstorm to prevent fungal colonization of wounds. 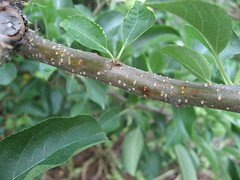 For example, orchards with fire blight can be devastated by the disease following a hailstorm because the pathogen rapidly colonizes wounds. 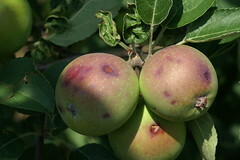 In orchards with a history of fire blight, and where no resistance to streptomycin exists, apply a streptomycin application within the first 24 hours following a hail event. 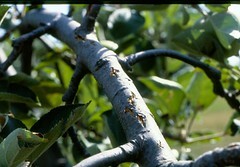 Examples of hail injury on apple trees and fruit.